Hidden away in the history-steeped foothills along the eastern slopes of the Blue Ridge Mountains, Philpott Lake is one of the most breathtaking bodies of water in Virginia. Over the last 65 years, it has evolved into one of the most beloved outdoor destinations in the state. 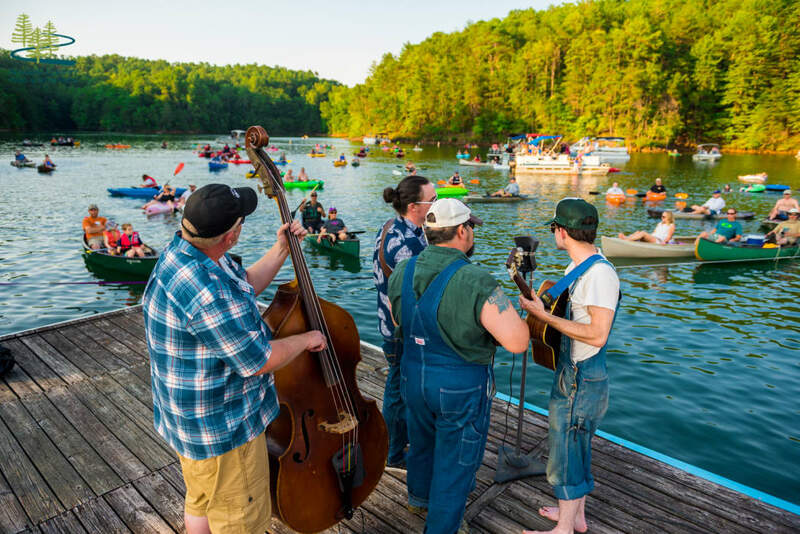 Surrounded by nearly 20,000 acres of protected federal and state lands, the 3,000-acre lake extends into Franklin, Henry, and Patrick counties of Southwest Virginia, providing a literal aquatic oasis for outdoor lovers. Today, the pristine woodlands cradling Philpott Lake are loaded with footpaths for hikers and runners, exhilarating trails for mountain bikers, secluded spots for birders, and plenty of water access for swimmers and paddlers. Unlike the waters of most lakes, these flow but a short distance from their source springs and streams unchanged through the passage of time. But the vast hardwood forests are also home to relics of the region’s rich past—back to a time before Philpott Lake existed and when the landscape was shaped by the moods of the gentle Smith River, occasionally raising an angry head with spring and fall surges. Otherwise, it gently flowed along with the passage of time. Philpott was once a small community called Town’s Creek. The area around Philpott Lake spreads over terrain with a colorful past, steeped with human history, likely dating back 10,000 years. The lake now covers a number of Native American archaeological sites. These locations now bear mute testimony to another time and era when settlement, hunting, fishing, and daily life once dominated the landscape. Little is known of the earliest Native Americans who occupied the area, but through archaeological research and archival documentation, we have a general idea. After 1,000 A.D., agriculture was more common along the major water systems with maize, squash, gourds, and beans. Just prior to arrival of the Europeans in the mid-to-late 1600s, the area was likely occupied by Tutelo, Saura, Occaneechi, Saponi, and others, who possibly spoke a Siouan dialect. One archaeological site, located just below what is now the Philpott Dam, is one of only a handful of locations providing archaeological evidence of extended contact between newly arrived Europeans and the Native Americans. The landscape that is now home to Philpott Lake was also likely crossed by two established Indian trail systems: the Tutelo-Saura Path, and the Saura-Saponi Trail. The former connected to the famously referenced Warrior’s Path—or Great War Trail of the Iroquois—which was a significant trading artery, hunting trail, and pathway for Native American voyageurs. By the mid-1700s, the path ultimately evolved into The Great Road, a thoroughfare connecting the Carolina Backcountry, via the Shenandoah Valley to Philadelphia. It passed just below where the dam is located. The route, south of the Blue Ridge, was commonly termed The Carolina Road. According to local authors Bell and Tracey A. Esplin, Philpott Lake was named for a small town that existed just downstream below the dam. The community began when A.B. Philpott established a store in 1905 at the mouth of Town’s Creek along a rail siding. 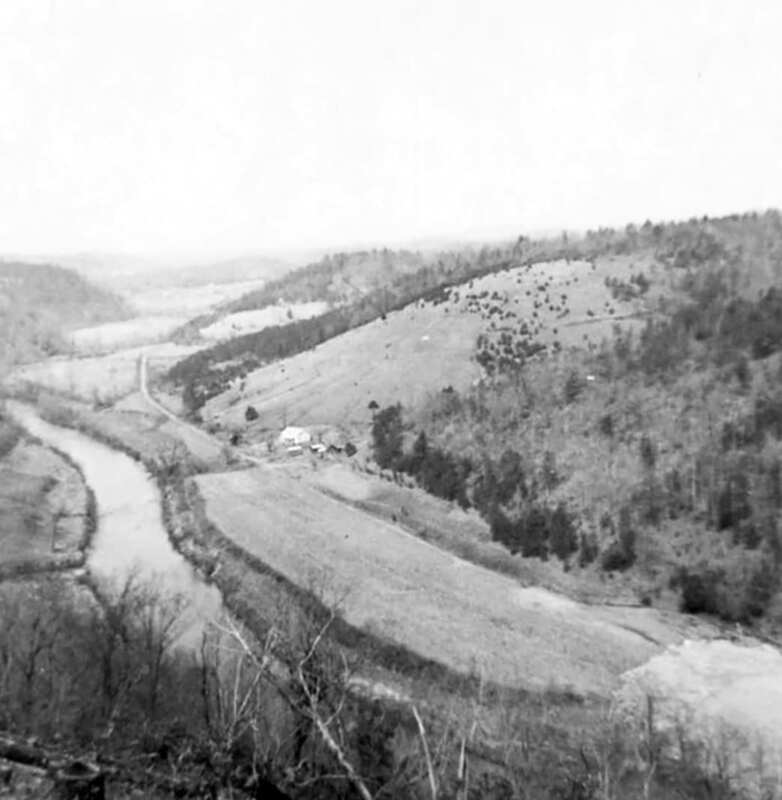 A railroad junction was established there when a 12.33-mile narrow gauge rail line of the Virginia Ore & Lumber Co. was constructed up the Smith River. It provided an important economic and social connection to the once thriving iron mining and timber operations at Fayerdale – now occupied by Fairy Stone State Park. Initially, the community was known as Town’s Creek, but the Norfolk & Western Railroad renamed the junction Philpott in honor of A.B. Philpott. The small community grew and included two stores, a barrel stave mill, and railroad depot. The community was also home to the Mountain Rose Distillery, which according to Chris Powell (operations project manager at Philpott Lake), was situated along the road now below the dam. This hidden gem has a long history in Franklin County. By the 1940s, communities spread along the Smith River were used to the waterway surging beyond its banks. The government, too, had taken note of water damage regularly experienced in the region. The monumental flood of July 1889, was the high water mark of the Smith River during the 19th century. There was interest in developing a project at the federal level as early as 1934 when a “Philpott Project” concept was discussed.Between 1899 and 1945, there were more than 200 floods in the region, but the tipping point was the flood of 1937, an event so severe towns like Bassett were swallowed by water. After the historic flood, the cost of repair in the region was astronomical, and over the next few years engineers proposed several dam locations. In 1938 there was public discussion about whether it would be more effective to dredge the Smith River and remove the many islands that impeded stream flow. In 1944, Congress legislatively authorized the construction of the Philpott Dam, tasking the Army Corps of Engineers with undertaking the project. The lake was but one unit of an 11-impoundment plan to control along the entire Roanoke River Basin. Work began on the 220-foot-high dam in 1948. 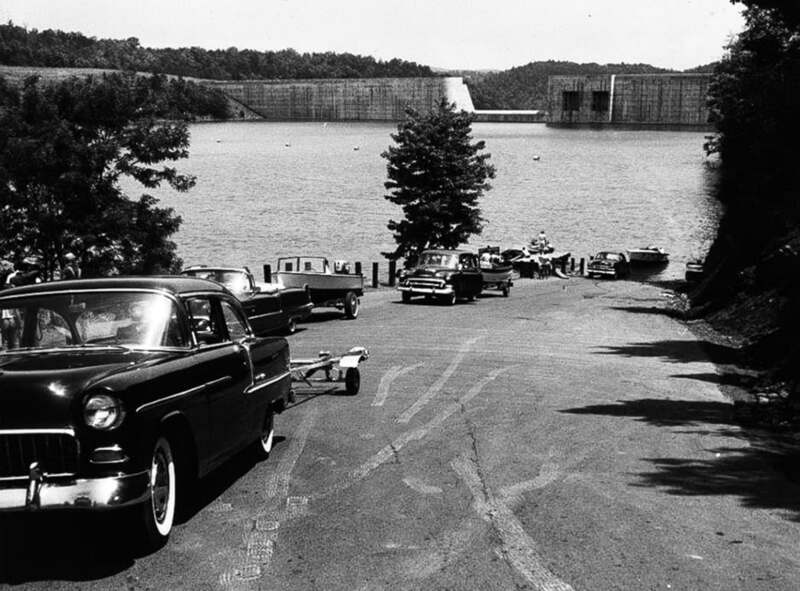 In 1951, water began to fill Philpott Lake, and approximately two years later, in 1953, the dam and powerhouse were both complete. Yet in early September of 1953 there were boats plying the waters and by 1954, Philpott Lake hosted the privately operated Twin Ridge Marina, 10 public boat access points, a roped swimming area (at Twin Ridge Marina), and nine year-round camping areas, of which three could only be reached by boat. 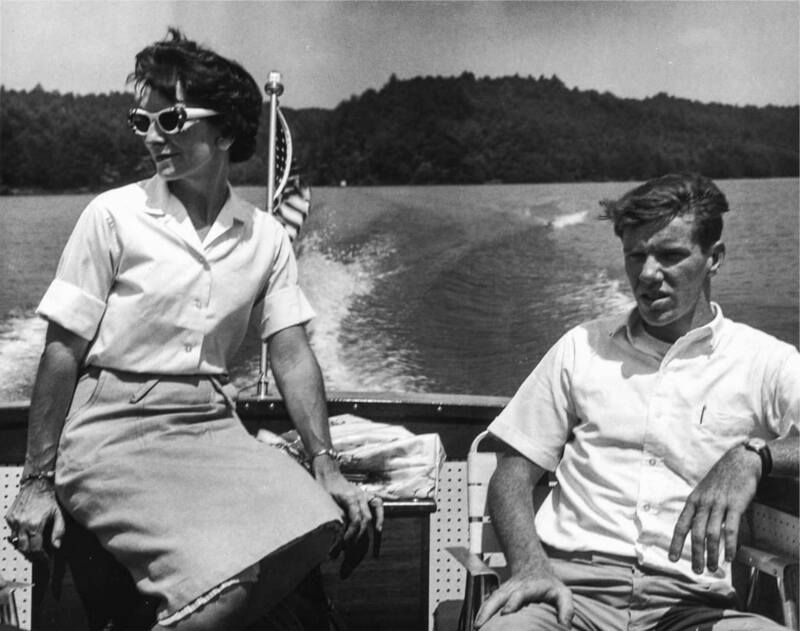 During the 1964 season, there were some 450,000 people out to enjoy all the lake had to offer, from boating to water skiing and fishing to picnicking. While there were apparently no reported fatalities during construction of the lake and dam, there was still a human cost. Between 1950-1951, there were two explosions within eight months of each other at the quarry dedicated to this project and six workers were killed. The lands now under water or lining the shoreline had at one time been owned or occupied by families for many years—often inter-generational. Clearing of the area within the lake bed—up to 967 feet in elevation—involved removing everything in its way, including the family homes. Everything below this mark was scheduled to clear within eight months beginning March 1952. All trees between the 967 and 935 elevations were to be cut flush to the ground. Most residents had abandoned the area by the end of 1951. The lake waters currently cover 19 cemeteries—though the bodies had been removed and reinterred during the summer of 1950. Based on an original map at the nearby Bassett Historical Center, we know the last landowners at the time of lake construction included family names such as Jarrett, Ingram, Turner, Foster, Clark, Mullins, Spencer, Bryant, Menefee, Brooks, Stone, Martin, Shelton, Bowling, Crawford, Mize, and Philpott. The largest community impacted by the lake was the community of Philpott, which had a post office established in 1900 and a railroad stop. The original post office and houses were absorbed by the lake. Throughout the valley, small farmsteads and homesites disappeared. The old Union Church had to be rebuilt on higher ground. Other losses included the old stave mill and store owned by Bob Carter, the Mullins store, Jamison Mill, and a historic iron bridge was lost. Hazel Via Hale’s 1988 book, Memories: Jamison Mill Era wonderfully captures mid-20th-century life along the Smith River. Many of the displaced residents and their offspring have maintained a strong bond through an annual Jamison Mill Reunion—a gathering for fellowship and reflection. Philpott Lake has attracted visitors from across the Southeast for decades. Although the reservoir was intended as a means of providing hydroelectricity and preventing flooding, Philpott Lake has been developed to maximize recreational potential as well. The lake was an instant hit with local communities, and over the years, outsiders have also discovered this regional treasure. Before the creation of Philpott Lake, the Civilian Conservation Corps (CCC) was active in the region. In the late 1930s, CCC recruits crafted trails in area foothills and forests—occasionally disturbing local moonshining operations. It was tasked with the construction of Fairy Stone State Park, which sits along the western fringes of Philpott Lake. In the early 1800s, a large iron mine operation existed in the Fairy Stone Lake area, along with a forge and processing facilities. Before the Virginia Ore & Lumber Company Railroad was extended to the operation, flatboats of the Smith’s River Navigation Company were used to transport products down the Smith River to the Dan River to Danville. A thriving community by the name of Fayerdale was established. By the early 20th century, global competition prompted a demise of the mining operations, replaced by lumbering. A fascinating historical record of all of this and more is available in Tracey Esplin’s 2009 book, 10,000 Years of History Buried Under a Lake: The Story of How Fairy Stone State Park Came to Be. On rare occasions, such as in 1999 when Philpott Lake dropped 16 feet, the old rail bed can be observed. With the creation of Philpott Lake, the region’s recreational infrastructure continued to blossom. Visitor-friendly amenities have been added throughout the years, and today, the crystalline lake is edged with nearly a dozen parks and recreation areas offering sandy beaches for swimmers, panoramic campsites, leafy woodland trails, fishing piers, and shady picnic spots. With a rollout of the country’s most comprehensive nature trail system in 2014, Philpott Lake was added to the book Discover Our Wildside: Virginia Birding and Wildlife Trail. In 2008, the U.S. Army Corps of Engineers and Friends of Philpott worked together in the development of trails for mountain biking, hiking and nature observation. Due to funding issues, the public camping facilities at Ryan’s Branch closed in 2007, although day-use and boat ramps were left open. A handicapped-accessible tournament facility was developed at Twin Ridge Recreation Area, near the geographical center of the lake, to replace a marina that had burned down in 2000. Improvements to the Twin Ridge Recreation Area in 2012 included a large handicapped-accessible mooring dock, a launch/retrieve dock, picnic shelter, and restroom facilities. Parking expanded to accommodate parking for 80 vehicles-and-boat trailers, upping capacity from 14 boat trailers and 10 cars. Thanks to these additions, the facility helped the lake to land a nationally televised fishing tournament in 2012. In 2014, a marina was added near the dam (along the mouth of Bowens Creek) to provide easy access for boaters. Three years later, Franklin County Department of Parks & Recreation assumed operations of the 300-acre Jamison Mill Recreation Area that had been closed for several years. A 50th-anniversary commemoration was held on September 13, 2003, with the 65th anniversary on September 22, 2018. As part of the 65th commemoration, the Philpott Lake Blueway was officially launched on May 6, 2018. A natural ecological balance evolved at Philpott Lake. Recreational amenities were thoughtfully developed, and the wildlands surrounding the water are still teeming with wildlife. Ample hunting opportunities are nearby. Songbirds linger in the treetops, white-tailed deer graze beside the water’s edge, and black bears have even been observed swimming across the lake. Beneath the surface, the water is also full of life. Philpott Lake has emerged as one of Virginia’s most beloved bass fisheries, but the lake is also a hotspot for walleye and is known to harbor gargantuan catfish. Enjoy a concert by canoe on Philpott Lake. “The best part about Philpott is that anywhere you paddle, you are surrounded by the gorgeous scenery which is the Blue Ridge Mountains,” says Brian Williams, program manager with the nonprofit Dan River Basin Association and owner of Smith River Outfitters. The most recent addition to the lake’s recreational repertoire, the Philpott Lake Blueway makes it even easier for paddlers to soak up the Blue Ridge backdrop. The result of a partnership between local and federal organizations, including the Army Corps of Engineers and the Dan River Basin Association, the blueway is a 25-mile water trail, studded with nine access locations and nine different points of interest, including secluded waterfalls and hulking rock formations. Williams recommends two of the paddling trail’s highlights—Calico Rock on the north side of the lake and secluded Bowens Creek Falls tucked away in the far southern corner of Philpott Lake. Blending scenic beauty and unparalleled outdoor adventures, Philpott Lake’s popularity is no mystery. Despite the buffet of recreational opportunities and visitor amenities, the wildlands surrounding the lake still feel undisturbed, and the water offers boaters and anglers a serene escape. The abundance of outdoor adventures, richly colorful history, and exquisite Blue Ridge backdrop will ensure Philpott Lake remains one of Virginia’s special lakes for generations. Written by Malee Oot and David Rotenizer for RootsRated Media in partnership with the Franklin County Office of Economic Development – Tourism, Virginia. Appreciation extended to Madherleyn Torres, William T. Buchanan, Jr., Nancy Bell, and Chris Powell who contributed research material.